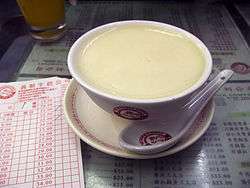 Ginger milk curd, also known as ginger-juice milk curd, ginger milk pudding or simply ginger milk, is a Chinese hot dessert originated in Shawan Town, Panyu District, Guangzhou in the Guangdong Province in southern China. The main ingredients are ginger, milk, and sugar. Water buffalo milk is used in the original recipe. First, cut a piece of old ginger into small pieces and grind the ginger to fine. Then, squeeze the juice out by pressing the ginger through a sieve. Put the juice into a bowl. Next, bring the milk to a boil and dissolve sugar in milk. Take off heat and allow it to cool a little. If you have a kitchen thermometer, place your kitchen thermometer into the milk. The optimum curdling temperature is 70 °C (158 °F). In the mean time, stir the ginger juice thoroughly. When milk temperature decreases to around 75-70°C, pour the milk quickly into the middle of the ginger juice. Wait for two to three minutes. The milk will then be curdled, and may be eaten with a spoon. Ginger contains the protease zingipain. When milk is added to ginger juice, this protease catalyses denaturation of the protein in the milk, changing it from a water-soluble form to a water-insoluble form, and leads to the formation of milk curd. ↑ "Ginger Milk Pudding". marecipes.com. Retrieved 19 June 2015.